About Us | Premier Paving Stone Ltd.
PREMIER PAVING STONE LTD. STRIVES FOR EXCELLENCE WHEN CREATING THE CUSTOMERS DREAM OUTDOOR AREA. INCORPORATED IN 2000, PPSL IS A FAMILY OWNED BUSINESS WHOSE GOAL IS TO PROVIDE QUALITY PAVING STONE INSTALLATIONS WHICH EXCEED THE EXPECTATIONS OF THE HOMEOWENER. WITH A TWO YEAR WARRANTY ON ALL NEW PAVING STONE INSTALLATIONS, CONSIDER THE DURABILITY AND ELEGANCE, STYLE AND UNIQUE DESIGNS THAT PAVING STONES CAN CREATE. 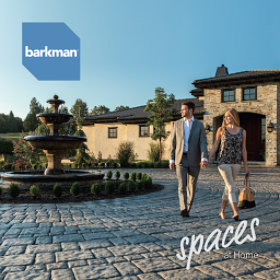 Laid out to be more space-centric, the 2016 Spaces at Home catalogue features Barkman’s full hardscapes lineup while embodying a more dream book feel, giving end users various ideas on how to creatively use Barkman pavers, retaining walls, slabs, landscape kits and planters. 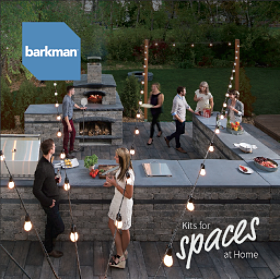 The new Urban Spaces catalogue features Barkman’s site furnishing products and showcases commercial applications. 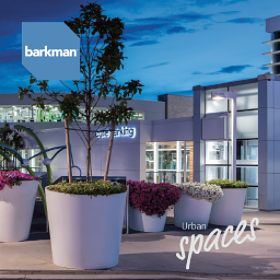 Its pages contain Barkman’s classic and GFRC planters, benches, tables, waste containers, accessories, custom solutions and other important information. The 2016 landscape kits catalogue features both the Stone Oasis and Harvest Grove Outdoor Kitchen kit collections. This catalogue also includes specifications and ideas to help end users build their dream backyards. 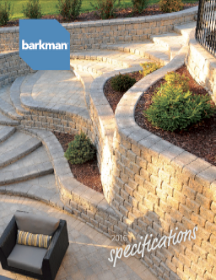 The 2016 Specifications Guide is a more comprehensive look of Barkman’s full product lineup. Pages include pallet and unit measurements, patterns, colour swatches, product codes, install recommendations, and a space per product to input pricing.